a FIRST Mom: Life with Lucas... and a Robot. From big to small, and even into adulthood, kids love toys! Most are fun to play with, others are educational, and some combine the two. Here are a few of my favorite (and least favorite, too!) toys from many years of experience. Here is another daycare favorite: water blocks. 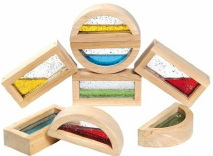 This company makes blocks filled with all sorts of stuff from beads to sand to various colorful liquid mixtures. The toddler favorite was always the shimmery water-filled ones. They're hard to track down at regular stores, but you can order them from Amazon, or different varieties from education supply stores such as Lakeshore. We had a TON of these Melissa and Doug puzzles at one of the Daycares where I worked. They're a little on the pricey side, but they're WELL worth the investment. They're made of very high quality and sturdy materials, and are sure to last for years and years, even with tons of abuse (and believe you me, those toddlers abused these puzzles!). The paint on the wood is very durable, and even with daily sanitation, never chipped, faded, or became distressed. 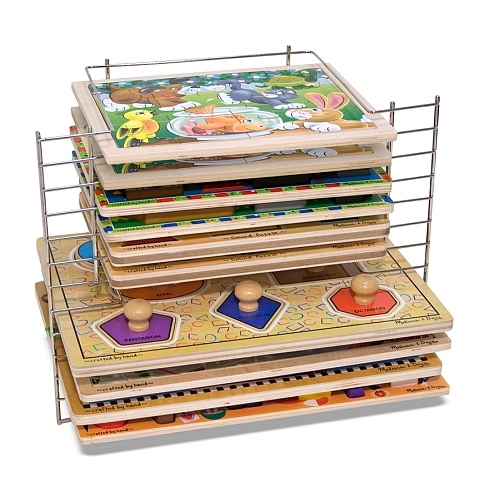 The company, Melissa and Doug, make TONS of toys, but their puzzles are some of my favorites. Don't forget to get the puzzle rack, it's worth the investment to keep your stuff organized! 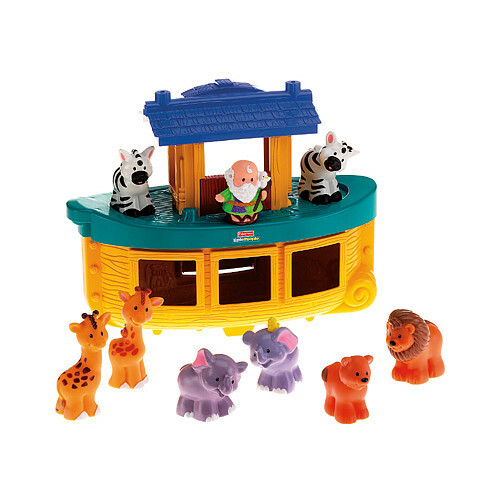 Lucas received this Fisher Price Little People Noah's Ark playset for Christmas before he was even born. At around 6 months, I pulled out the animals for him to play with, and he's been in love with it ever since. Now that he's a bit older, he plays with the Ark, too. I'm pretty sure that it's only safety rated for toddlers, but we've never had any issues with choking hazards or small pieces. This particular set is a little difficult to find, but you can order it online from Toys R Us, and some other retailers. I wish that it came with more animals, or that you could order more online, but they're pretty difficult to track down, and very expensive once you do. Lucas really loves this vTech barn-themed walker. It has a ton of interactive buttons, which light up, sing songs, and teach colors, numbers, and animal sounds. The electronic portion has a volume control with two settings, an off switch, and an auto-off function. It rolls kind-of fast for Lucas' wobbly walking ability, but it seems to help him stand with stability and hold his interest. It works well on carpet and in small rooms. One of the best features of this toy isn't listed in the description, which is the fact that the toy actually attaches and detaches from the walker quite easily. So your baby can play with the interactive barn on the floor while they are small, and grow into using the walker feature. There are many varieties of these walkers, get yours at Target . Clinton and I purchased this toy at Target on a whim, and more so for our entertainment than for Lucas'. As it turns out, it's pretty fun. At 10-months old, Lucas still doesn't get the entire concept of chasing the balls and putting them back into the Popper's cycle, but he likes to watch them pop out, and to dance with the music. He figured out how to turn it on almost immediately after opening the package, and loves to put his hand over the air flow. The reason I'm giving this a "sideways thumb" rating is because it's REALLY loud. The blower motor sounds like a vacuum cleaner, and the music volume isn't adjustable. The toy is cute, but only for about 5 minutes, and then it just turns into a loud, annoying elephant. We also received this as part of our hand-me-down-haul, and call this an "Adventure Center", and Lucas absolutely loves it. We started using it when he was itty-bitty, and he still loves to play in it now. The items that hang down are easily moved and removed, and the mat is machine washable. 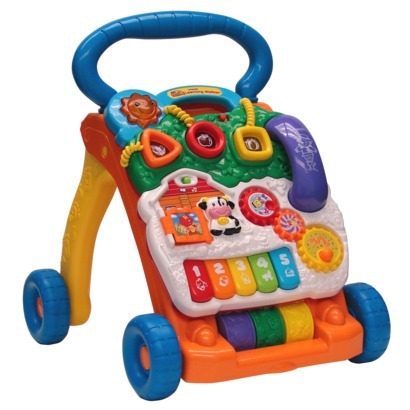 It is battery operated, and plays cheerful songs, jungle noises, and has a pull-to-play feature. 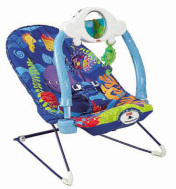 Fisher Price Cradle n Swing comes in a huge variety of designs and themes, and is available at Target and Babies R Us. Lucas has the Ocean Wonders design, and it's great! It has a cute fishy theme, and plays music, waves, rain, and running water sounds, and has a light-up globe! You can operate the 3-direction swing, mobile, lights and sounds independently, in any combination you choose. It is powered by standard 120V outlet. It comes with a snap-on tray for play time, and has a 12-minute auto-shutoff for nap time. The seat cover is easily removed, and machine washable. A Fisher Price Bouncer (available at Target and Babies R Us) is a bit of an investment, but is well-worth it's weight in gold. Like the swing, it has a super cute fishy theme, and plays music, water, ocean, and has lights. When used in discovery mode, the dangling fish cause the chair to play sounds when kicked. It's perfect for lounging, and the vibration mode is calming, especially for just-born babies. The buckle is nice, and Lucas can't get out of the chair or tip it over, so it's ideal for times when I want him to stay-put. The cover is machine washable. The only down-side is it requires 4 D-sized batteries, and doesn't have an auto-off function. Fisher Price makes an entire line of Jumperoos (available at Target and Babies R Us) with various themes and attachments. Lucas loves his, and plays in it all of the time. It's great exercise for him, and the toys promote large muscle development and hone small motor skills. It is battery operated (3 AA), and has three height settings, so it can grow with your baby or toddler. It plays lights up, plays music, and has a jump-for-noise setting. The seat cover is easily removed and machine washable.